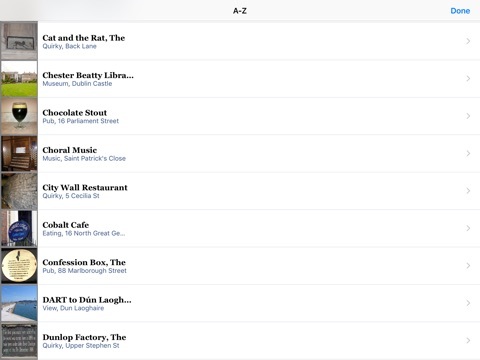 Secret Dublin app: insight & download. Now with iPhone 6/6s Support and iOS9 Support ! Discover a hidden world beyond the Temple Bar, the Liffey and Dublin Castle. Are you a visitor to Dublin looking for a secret side to this amazing city ? Then this is the app for you ! Written in conjunction with a local expert, Secret Dublin will help you discover nearly 60 unusual, amazing, intriguing and surprising places to visit in the Emerald Isle's capital city. + How to spot Dublin's hidden river. + Cracked coffins and grisly mummies. + An unusual hidden shop in a Barber's shop. + A hoax plaque to a fake priest. + Dublin's most elegant place to drink. + The mythical Kelpie and where to spot this elusive beast. + A very hungry tree. + Where to taste chocolate stout. + Amazing tributes to Irish legends of rock. + Ancient Irish folk stories around a blazing fire. + Where to have a go at pulling your own pint. + Part of Dublin's old city wall in a very unusual location. + Viking heritage right under your feet. + An underground charter house. + Dublin's best hidden places to eat and unusual hotels. Includes full details for each place, including opening times, address, price and nearest tram stop. The app also features a unique picture browsing mode which will help you explore these amazing places and a handy map mode so that you will never be lost on your travels. 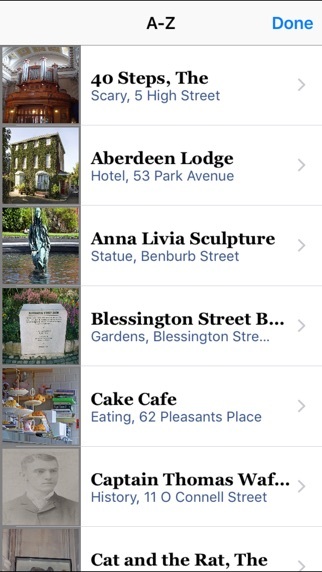 Download and start exploring a new side of Dublin today. I am an independent iPhone developer living in London. I have a passion for Europe's unusual places. I really hope you enjoy the app and drop me a line using the in app feedback !